I get the 9.27 from Exeter St Davids to Barnstaple, which has started out as the 8.53 from Exmouth. Exeter St Davids has six platforms and my two car Class 140 DMU leaves from platform 3. A South West train to London Waterloo is leaving from platform 1 at the same team, as we leave in the opposite direction. We go eastwards and across a level crossing and then pass the old goods shed on the left. There are some sidings on the right where South West Trains are stabled. There are also some sidings on the left but they are all empty today. It is mainly flat land on the left, with brown cows grazing in the fields, with hills beyond them. On the right is plenty of housing, mainly bungalows. We leave the mainline to London at Cowley Junction and turn north eastwards, crossing a small river and then the larger river Exe. We then go into a cutting and then pass through a gap in the hills, reaching speeds of around 50 mph. The land is flat on the right, with sheep grazing in the fields, which then become ploughed fields. It's now flat land on both sides as the train passes through Newton St Cyres without stopping. It has a single platform with just a small shelter. The original station house is still there as a private house. The scenery starts to get more hilly as we go over a river and see the odd farm on either side of the track. It becomes more wooded before we go into a short cutting and then the river Yeo runs parallel to us on the right. 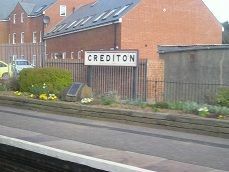 We then see the A377 and a new Tescos on the right as we slow and arrive at Crediton station. It has two platforms and is one of the larger stations on this line, with two platforms. The main station building is on the opposite platform, where another train is waiting and our side is a smaller wooden clad building. On the other platform is a lovely flower bed, with a plaque in it and the old Great Western station sign in. As we leave, we go over a level crossing and get the token for the next stretch of line, from the signalman, whose box is on the other side of the level crossing. We then move over to the right hand track, whilst the left hand track runs parallel to us as far as Yeoford, before leaving us to go to Meldon Quarry. It looks quite rusty as if it hasn't been used for a while. We go quite slowly at first, until we have crossed over an unmarked crossing. We then speed up again, going over the river Yeo again. It's quite on the right, but hilly on the left, where cows are grazing. We enter another cutting as the landscape becomes more hilly again, with farms the only buildings to be seen. We then slow to stop at Yeoford, which has a single platform, with a nice white panelled large shed-like waiting shelter. One person gets off here. We start to move uphill as we pull away and go onto an embankment. The line to Meldon Quarry leaves us on the left, whilst sheep are grazing on the right. It's now very hilly as we continue to climb. We cling to the edge of a hillside on the left, before going into a cutting and then onto an embankment. After passing through another cutting, we enter Copplestone station, which is on our left hand side. It has a large aluminium framed shelter, with the original station house now a private dwelling. One passenger gets off here. The land is flatter here, though with more trees to be seen. We go into another cutting and then slow as houses appear on the left and we come into Morchard Road station. It's a similar set up to Copplestone with the same aluminium framed shelter and private station house. As there are no passengers, we don't stop and soon speed up to 50 mph. There are sheep on the left and cows on the right, as we move sharply to the right in a cutting and then move to the left and see lots of houses on the hillside on the right. We slow but don't stop at Lapford station, which has a large cream coloured station house on its single platform on the right, and a passing loop on the left. We go into another cutting and then cross over the river Taw. It's quite wooded here as we go into a low cutting, with trees on both sides and start to go downhill. We soon come to Eggesford, which has two tracks and two platforms. It's a nice country station, with curving platforms in a small village. There is an aluminium framed shelter on the left hand platform and a large brick station house on the other platform. We wait over five minutes here until a train comes into the other platform. We then move off after getting the token onto single track again, this time all the way to Barnstaple. We pass a pond and several cottages with daffodils in their gardens on the right. We go over the river again and curve to the left as we go downhill, speeding to 50 mph. We are on unwelded track and the land is flatter again, with the hills in the distance again. We go into a cutting again, before emerging into a wooded area, speeding through Kings Nympton station. It's quite isolated here, but the station has a shelter and the original station house in place. We go over the river Taw again, which now runs more or less parallel to the railway line the rest of the way to Barnstaple. We see several sheep and our left with their lambs in the fields on the right, We move sharply to the left with the river's flood plain to our right. We then pass through Portsmouth Arms station, another isolated place with few houses nearby. There's a single platform to our left with a small shelter, but the train doesn't stop. We go over the river and into a cutting, still moving downhill. We cross the river again and have the flood plain on our left and hills on our right as we travel along a low embankment. We slow down but don't stop at Umberleigh station. It has an aluminium framed shelter and the original station building, with more house by the shelter. We then cross over the river again and the landscape is much flatter on both sides now, with the hills far in the distance now. There is a playing field on the left and green fields on the right. We are now doing 50 mph now and speed through Chapelton station. It has a platform and shelter on our left and the remains of a platform and the original station building, nicely restored on the right. We now continue in a straight line all the way to Barnstaple. There are still isolated farms on either side and you can see a quarry in the distance on a hillside on the right. On the other side you can see a large cream coloured building on the left hand hillside. More houses appear on the hillside on the right and we move back onto welded rail at last. We cross over the river taw again and go under the A377 and see Barnstaple on the right across the river Taw. We start to slow as the A377 runs parallel to us on the left and we pass old sidings on the right. We then come into Barnstaple station which has two platforms but only the right hand side one is used and it has just a single track. There is a large car park on the right, with out of town shops beyond that and trees on the left. The original station building is still largely in use as a station for a change, with ticket office, waiting room and café all within it. About thirty passengers are waiting to get on and several actually get on the train before my self and several others have a chance to get off.